Tuesday June 9th 1891 We finished the ironing and done baking. Mother & Father went to town to stay a couple of days. I done some sweeping and practiced some in the afternoon. Wednesday June 10th 1891 It was a showery day. Sell show was in town and it rained during the street parade. I could not go over I put in the afternoon sweeping and cleaning the front part of the house. The folks came over from town with their suppers and they went home in the rain. 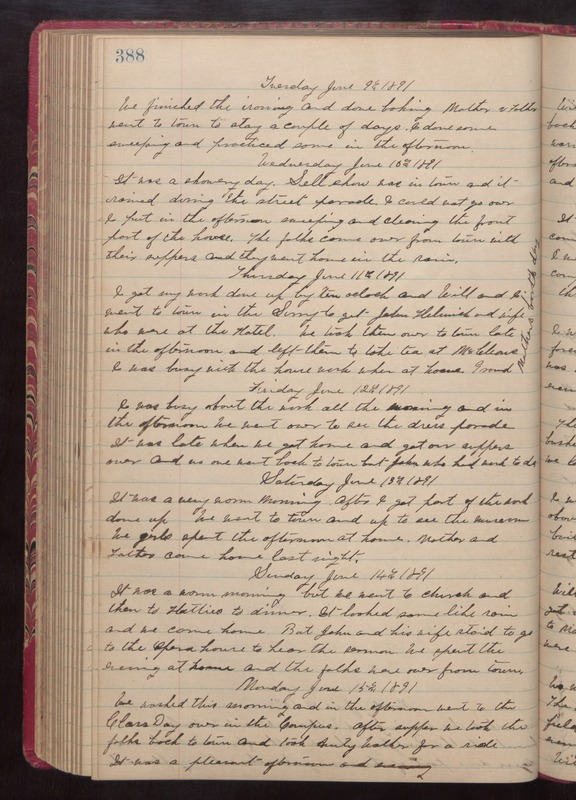 Thursday June 11th 1891 I got my work done up by ten oclock and Will and I went to town in the Surry to get John Helmish and wife who were at the Hotel. We took them over to town late in the afternoon and left them to take tea at McCleons. I was busy with the house work when at home. Grand Mother's birth day. Friday June 12th 1891 I was busy about the work all the morning and in the afternoon We went over to see the dress parade. It was late when we got home and got our supper over and no one went back to town but John who had work to do. Saturday June 13th 1891 It was a very warm morning. After I got part of the work done up We went to town and up to see the museum. We girls spent the afternoon at home. Mother and father came home last night. Sunday June 14th 1891 It was a warm morning but we went to church and then to Hatties to dinner. It looked some like rain and we came home. But John and his wife staid to go to the Opera house to hear the sermon. We spent the evening at home and the folks were over from town. Monday June 15th 1891 We washed this morning and in the afternoon went to the Clars Day over in the Campus. After supper we took the folks back to town and took Aunty Walker for a ride. It was a pleasant afternoon and evening.